It all started, so they say, when Graeme Cairns (of the Big Muffin Serious Band) acquired, in the course of having numerous flatmates, a bucket of toothbrushes. Te Pahu is half an hour from Hamilton, in the heart of Waikato cow country. The landscape is rolling green, dotted with trees and streams and small farms. It’s beautiful but rather samey, without much in the way of landmarks, until you turn a corner and see toothbrushes strung the length of a paddock. At first the fence grew slowly, as friends and visitors added their own brushes. But its fame spread. 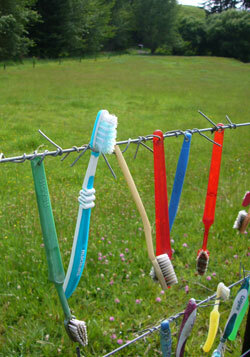 Backpackers began making a pilgrimage just so they too could contribute to the Toothbrush Fence. Its GPS coordinates became well known amongst rally-car orienteers, who would use it as an eye-catching waypoint. 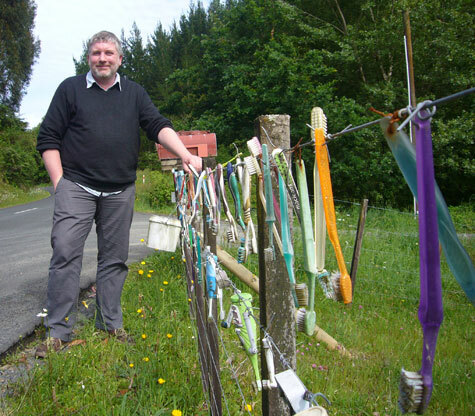 People overseas even sent brushes to be added (c/ “The bucket on the toothbrush fence, 294 Limeworks Loop Rd, RD5, Te Pahu, NZ”). Celebrities added brushes, including Prime Minister Helen Clark, who hails from Te Pahu. But surely the fence’s finest hour was its mention in Season 1 of Flight of the Conchords (Bret Gives Up the Dream) when Murray, responding to the taunts of the Australian consul, points out that while Australia might have Ayer’s Rock, we have “a fence made of toothbrushes.” New Zealand hearts swelled with pride upon hearing those words, for we know the Toothbush Fence epitomises all that is great about this fair land of ours. Graeme Cairns is a member of the McGillicuddy Serious Party from way back, and the fence began as an absurdist art project, a satire on more earnest and legitimate tourist attractions. Its becoming a tourist attraction in its own right, despite being of no historical or political significance whatsoever, proves that people appreciate a little absurdism in their lives. The fence is a success because it’s a participatory artwork. Nina Simon, in her book The Participatory Museum, describes a new generation of exhibits to which visitors can actively contribute; to work, the visitor interaction needs to be structured in some way, not forbiddingly freeform, and have a low bar for entry. Adding a toothbrush to a fence fits the bill, whereas painting part of a mural or carving a comment into stone is too demanding. (Perhaps vandalism at historic sites is just a frustrated way of taking part in the experience. There’s no vandalism at the Toothbrush Fence, though perhaps some locals view the whole thing as vandalism). The other secret of the fence’s success is that it’s a work in progress. Visitors or donors feel like they’re adding to a project rather than observing a finished work, and they can point to their one small contribution. It started with just 50 toothbrushes; if Cairns had solicited a thousand toothbrushes in advance and created a finished artwork, it would have less appeal and fewer visitors. In a country where tourist attractions are becoming increasingly marketed and packaged, it’s refreshing to come across one without its own brochure, or even a little plaque explaining what it is. The Toothbrush Fence exists happily without an AA signpost; it does not have its own domain name; it has no plans to tweet. Want to visit the Toothbrush Fence? View the Toothbrush fence in a larger map. This entry was posted in Pointlessness, So-Called Journalism on 17 Nov 2010 by Mike. Love it! Things like this (and Carlucci Land in Wellington) are what makes New Zealand endlessly fascinating and delightful to me.